As an intuitive Astrologer, I love to share my astrological knowledge acquired over years of study and hands on chart preparation. I believe that in order to experience growth along our earthly journey that spirituality should be blended into our daily living. As a result, I also share my "Food for Thought" writings which are inspirationally received. "You can accomplish anything in life if armed with the right attitude & tools. My wish is to provide a useful tool." The sun entered the sign of Gemini late Sunday evening (May 20, 2018) in the Toronto, Ontario area. Gemini is a mutable, air sign. 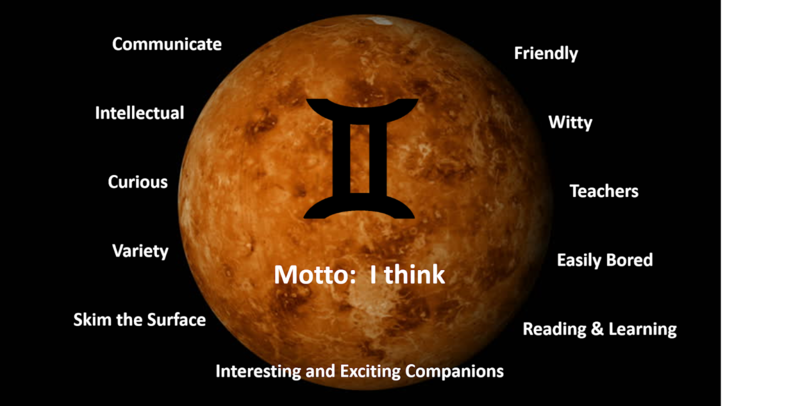 Those with their Sun in Gemini are adaptable, changeable, versatile and intellectual. They are great communicators and love stimulating the exchange of ideas and knowledge. They enjoy change in its many forms, can easily become bored and can become moody when life is less than interesting. Those with Gemini strong in their natal charts are the conversationalists of the Zodiac and often have many acquaintances from many walks of life. The house position of the Sun in the astrology chart will have an influence on how the energies of Gemini (and any other sign for that matter) will be transferred. Those with their Sun in the ninth house could be considered philosophers and are often concerned with higher learning. Those with their Sun in the second or tenth house are often career focused and can be stability seekers especially when it comes to finances and social status. Those with their Sun in the seventh house and with Gemini on the seventh house cusp will be attracted to intellectual mates that they can carry on stimulating communication with. Don’t forget each house takes on the flavour of the natural ruler of that house. (Aries is the natural ruler of the first house, Taurus is the natural ruler of the second house and Gemini is the natural ruler of the third house and so forth). Geminian individuals are considered friendly, cleaver and witty people. They truly like most individuals and most people like them. They make great teachers, are quite able when it comes to writing and communicating their ideas, love to share and display their intellect and make interesting and exciting companions. Those people with their Sun sign in Gemini will have transiting Saturn and transiting Pluto in quincunx to their natal Sun if they are within orbs of influence. (Five degrees approaching and two degrees separating). Currently Saturn is at 8 degrees and is in retrograde, while Pluto is at 21degrees and also in retrograde. The quincunx aspect often implies that an adjustment is required. So if you were to take the house position of the transiting planet as well as the natal house position of your Sun, you would have a pretty good idea of what areas of life would be involved and what adjustments might be required. Remember to also have a look at the natal position of these transiting planets as this will provide you with more information as to how these energies are playing out in your life. Any natal aspects between these transiting planets (for example, natal Sun square Saturn or natal Sun trine Pluto) will also show how these energies might unfold. The natal aspect should always be part of the delineation. The natal aspect often tells the story and adds energies to the unraveling of the transit’s aspects in the natal chart. A natal Sun in Gemini in the second house and a transiting Saturn in the seventh house along with Pluto, for example, could be speaking in terms of security issues. This could relate to financial issues or go deeper into internal issues but would be related to the marriage partner or a business associate. If natal Saturn for example was in the fifth house and squaring the natal Sun in the second, this could be related to children within the marriage or creative enterprises linked to the marriage partnership. The whole chart would have to be defined to get the full picture however. Quincunxes at times have been linked to health concerns, although once again the whole picture needs to be examined carefully before making any conclusive statement. This could involve children (5th) friends (11th) the husband or wife (7th), and so on and if it is personal health concerns, you would have to look at the Sun and sixth and twelfth houses as well as the Ascendants overall condition in the natal chart and the transits to these positions. Much can be discovered through a careful analysis of the horoscope and transiting planets (as well as progressions and the solar chart which helps define the upcoming year in advance). This is why the local newspaper article or internet post seldom applies to most sun signs. There are too many other factors at play to be that general. Visit www.holmastrology.com for more information on Astrology and information on the Astrological charts we offer. Please “Like” us on Facebook. Your “shares” are appreciated and your questions are welcomed. All rights are reserved. This blog or any part thereof may not be reproduced or used in any manner whatsoever without the express written permission of Holm Astrology except for the use of brief quotations to our website, blog or facebook page.